Ellicott City needs your help. Here’s what you can do. I’ve never experienced the terror of a flash flood first-hand, so when video of what happened in Ellicott City, Md., surfaced on Facebook, it shook me. It starts as mere curiosity — some folks at a restaurant marveling at a deluge of water flowing down the street. It ends in a series of oh-my-gods as the reality of nature’s wrath settles in. 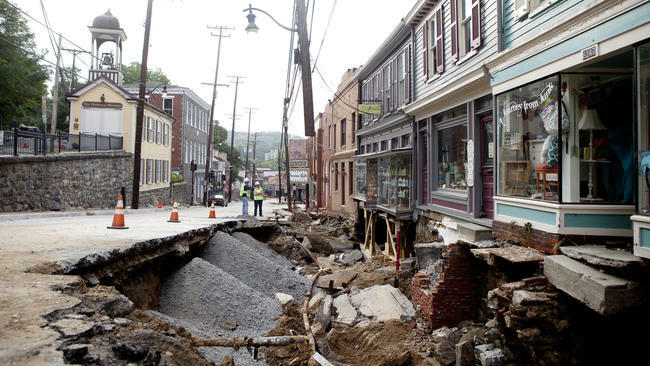 Historic Ellicott City was devastated. Two people were killed. Businesses were looted and destroyed. (The photo above is from The Baltimore Sun.) Lawmakers are vowing to rebuild, but still, folks there need help. If there are any residents you know who need assistance, have them call the following number: (410) 313-2900. To donate food, contact the Community Action Council of Howard County. Financial donations can be made to the American Red Cross Greater Chesapeake Region. Ellicott City Partnership created a page to assist the flood victims. The United Way of Central Maryland has established the ECStrong fund. All donations received through the fund will go toward those affected by the floods. To donate, text “ECStrong” to 51555 or goto www.uwcm.org/ECStrong. On Aug. 4, Jailbreak Brewing Co. is holding a fundraiser for flood victims. One hundred percent of the brewery tour donations and 50 percent of all revenue will be donated to the charities assisting in the recovery efforts. On Aug. 6 and 7, Heavy Seas Brewery is holding a fundraiser and donating 50 percent of all revenue made this weekend to the Ellicott City Partnership. Heavy Seas brewery will also be accepting and delivering donations to help with the clean up of the town. Mama’s on the Half Shell and Nacho Mama’s will be donating 20 percent of all food and beverage purchased through Friday from 2 to 5 p.m.